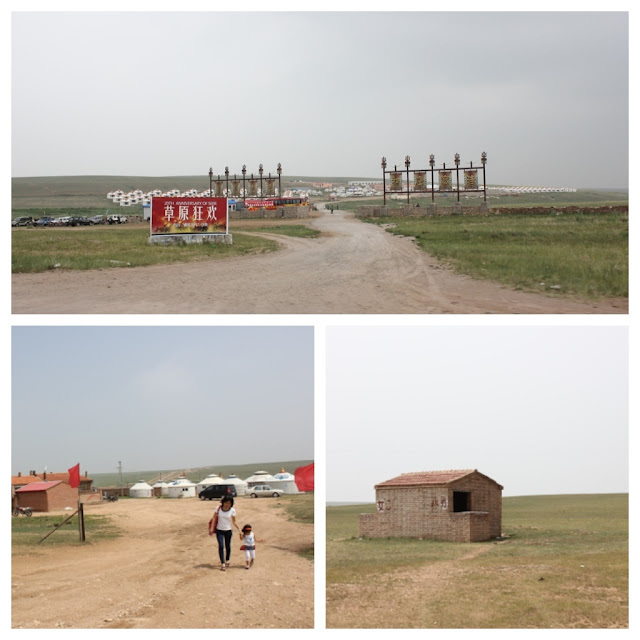 Today was the tour of the Grassland, a popular tourist site in Inner Mongolia. It was quite the cultural experience...nothing like any other place we visited so far. If you have a weak stomach, you may want to skip through some of the pictures I'm posting today. We drove through the mountains for 2 hrs to get there. It's so interesting...as we drive through the city and the countryside, there are really old, run-down shacks that people live in (or used to live in), next to newer, developing condos/apartments. These buildings are being built everywhere...usually 4 or 5 of them at the same time. 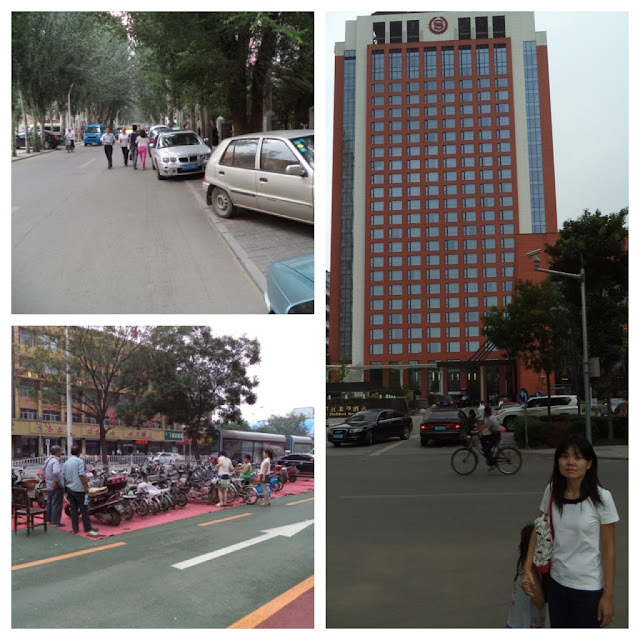 Aggie (our tour guide) said that because the standard of living is improving for many Chinese people, a lot of them are living in these newer condos/apartments. 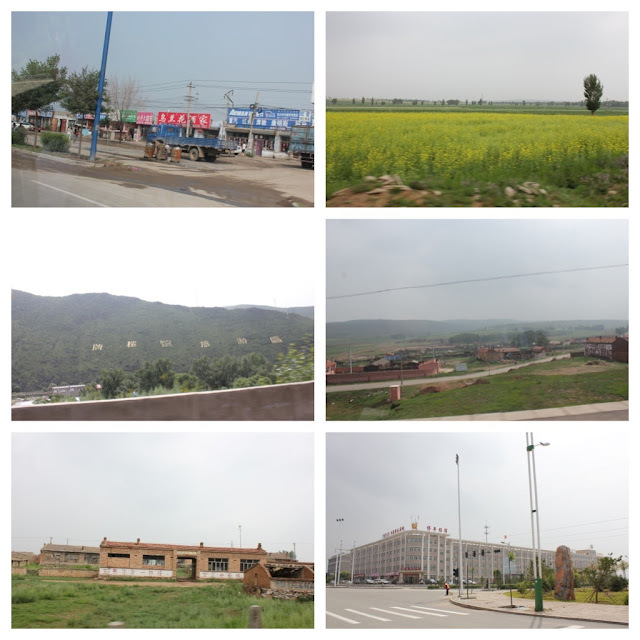 Some of the newer towns that we drove through - Aggie said they didn't exist a year ago. 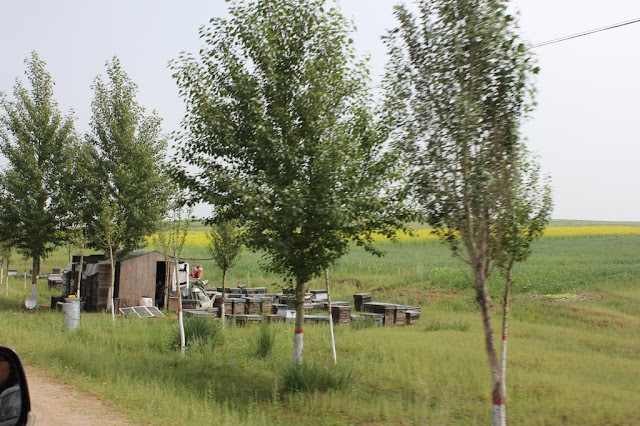 We passed by a lot of these traveling honey stands...where they maintain the bee hives and prepare the honey right on the spot. We finally reached our destination. 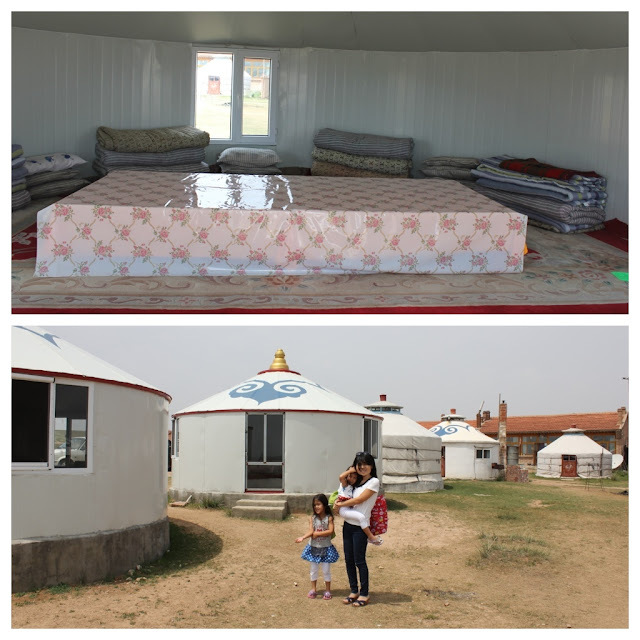 There are numerous tourist spots to visit these "yurts" (tents) that Mongolian shepherds used to live in (they are mainly for tourists now). The top picture is a more commercialized spot; Aggie took us to a more local one, run by a family who lives there (see bottom pictures). 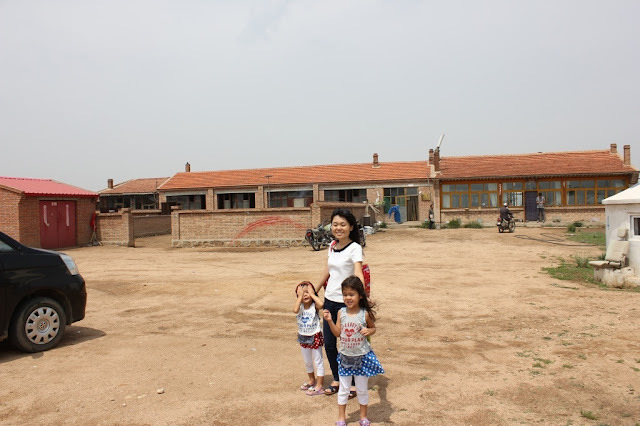 We got to share in the local experience right away when we had to use their outhouse - needless to say, it was quite an ordeal for the girls and me. 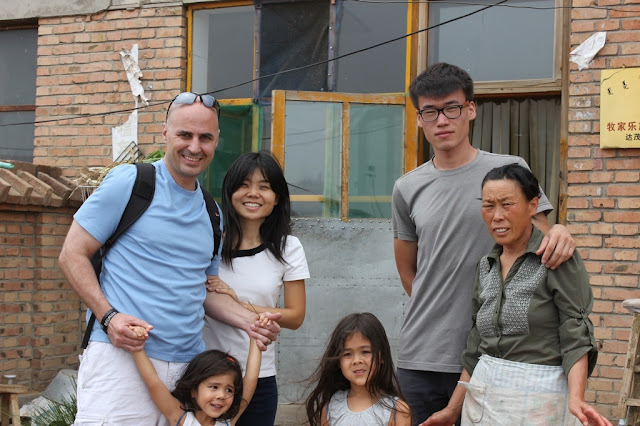 We were invited inside this Mongolian family's house. They served us warm milk tea and some snacks. 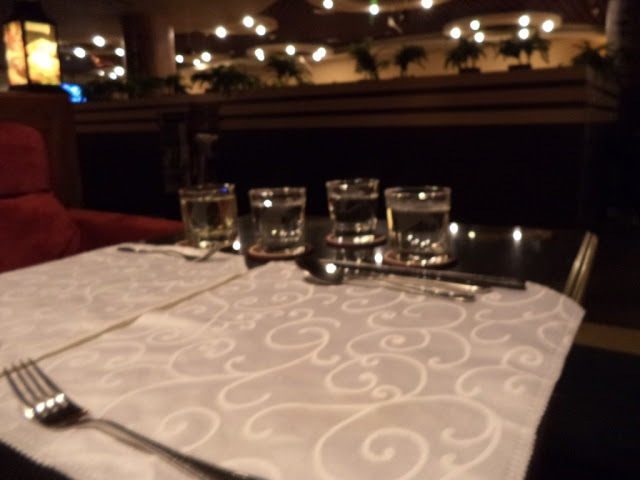 We didn't care for the drink or the food, but we appreciated their hospitality. 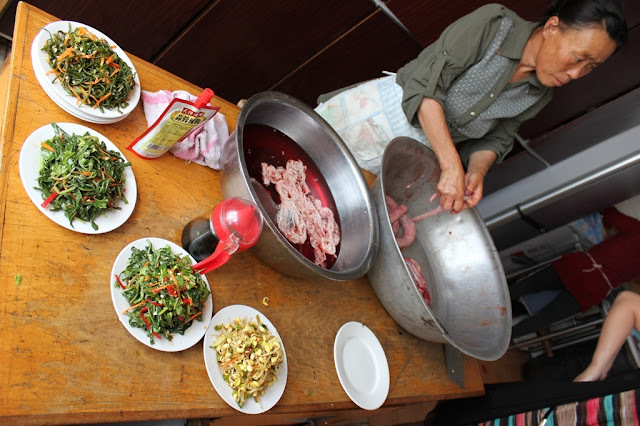 Aggie told us that Mongolian food is very different from other Chinese food. As we were walking outside of their house (to explore the surroundings), this was what we encountered. Peanut was intrigued. I tried my hardest to not throw up. Yes, that is a head you see on the ground. 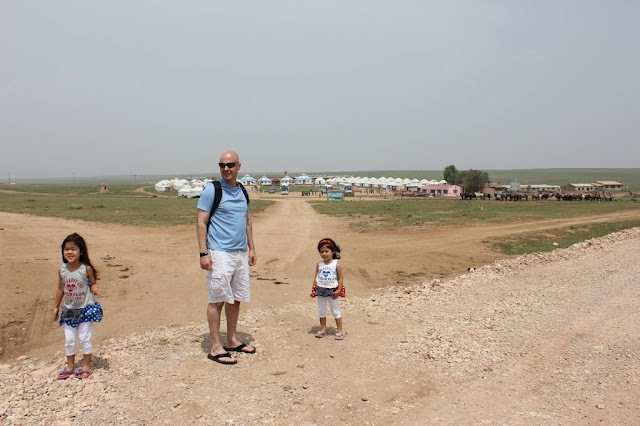 These are the yurts we visited...they are available for tourists to stay. This is a more commercialized spot, across the street from the local one we visited. In front of the Mongolian house we visited. 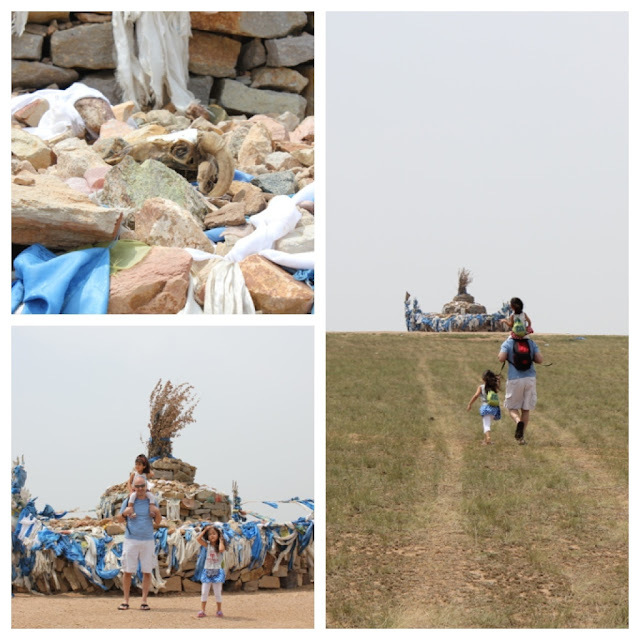 We took a walk up the hill to an altar that they used for sacrifice. Aggie said something about taking a stone, walking around it six times, and putting the stone back to make your wish come true. We saw a little boy performing this ritual when we got there. And yes, that is another head we saw on the altar. Some more pics from our visit...these large black insects were everywhere on the road. If you know about me and bugs...I seriously thought I was going to faint. 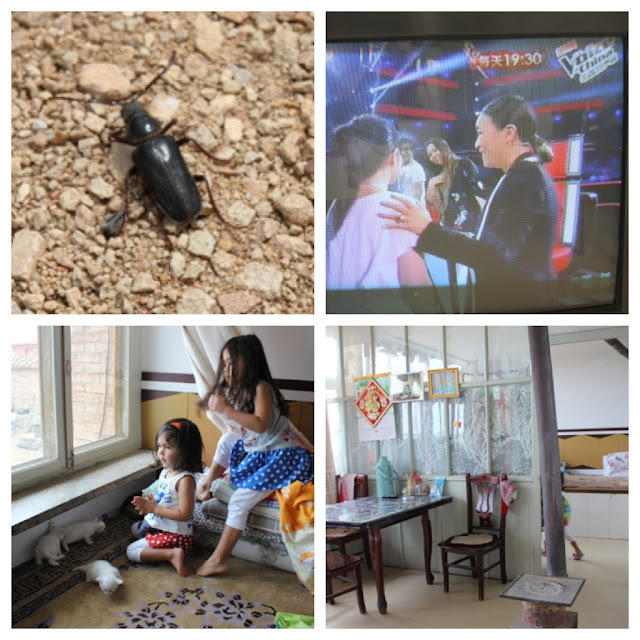 Apparently reality TV singing shows are big in China - we see "Chinese Idol" and "The Voice of China" on TV all the time. They had new kittens at the house we visited - the girls were obsessed with them. The "mom" of the family was preparing lunch. Aggie assumed we would not want to try their food, so she did not set up lunch for us. I am eternally grateful to her for that. We asked what she's stuffing - Aggie said they're mostly lamb and blood. They also eat intestines and various organs. Lovely. Again, I tried not to puke. Again, Peanut was intrigued. She put her face right in the bowl and said, "Look! She's making food out of the sheep!" We took a picture with the family before we left. It was obvious that this was a huge tourist attraction for Chinese people. 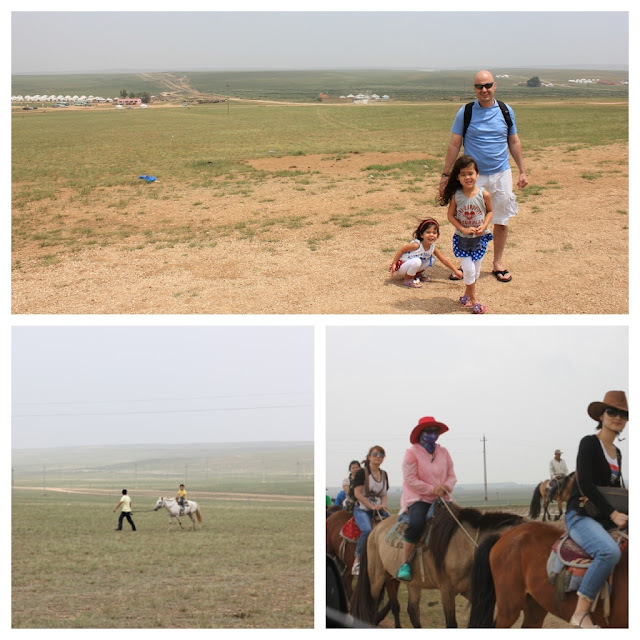 We saw many of them riding on horsebacks. Here is a "toll booth" we passed, Chinese style. 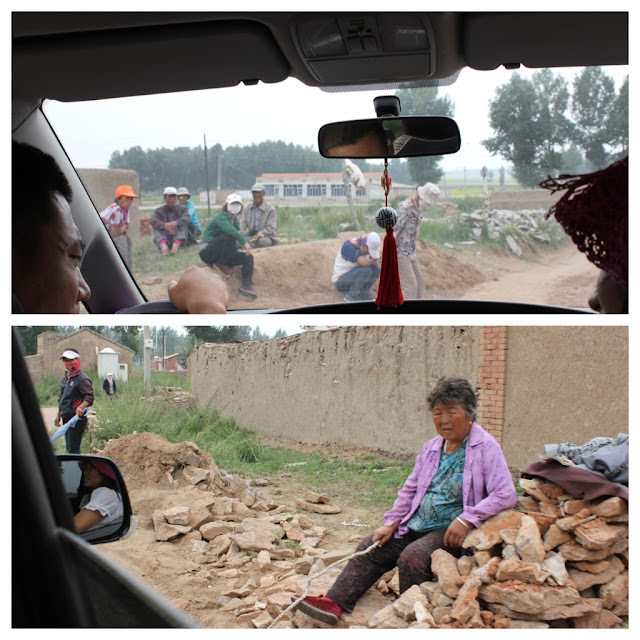 Aggie said this was a shortcut way back to the city, but these locals will not let you through unless you pay money (she's holding a rope so the car will not pass through). This is illegal and they were fined a few days ago, but it obviously did not stop them from continuing. We returned to our hotel and said good-bye to Aggie until tomorrow. We ventured out to find dinner and also to find an umbrella stroller for Siana. We were not very successful tonight. It's becoming obvious that unlike Beijing, people here are not used to foreigners. It's much harder to find something we're looking for or to communicate with the people at the stores. Some are friendly; some are not. We were only able to find more expensive kind of strollers (not umbrella ones), so we decided to ask Aggie about it more and try again tomorrow. We ended up going to a western-style restaurant that Aggie had recommended. By this time, we were pretty exhausted from trying to maneuver our way through this town as foreigners who don't know anything. I was starting to feel homesick for the first time. Here are more pictures of the hotel surroundings. As Aggie said, "Chinese people do whatever they want." People drive however they want; they don't watch out for pedestrians; and they park wherever they want. Notice all the cars parked on sidewalks (which makes it very hard for pedestrians to get around). Today I saw a guy finish a soda bottle in the car and just throw it out the window as he drove by. 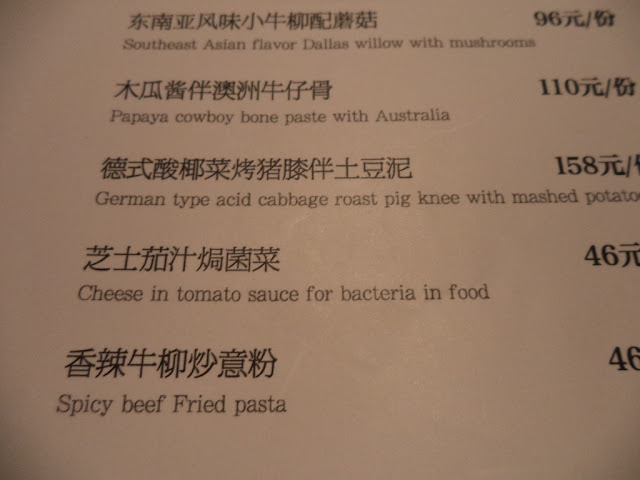 At the western-style restaurant, I had to take a picture of the English translation of this menu. Hilarious. They don't serve water at most restaurants. Last night they gave us hot tea. Tonight they served us hot water with lemon. So this was our adventure for today. We know for sure that there's NOTHING scheduled for us for the next two days, other than getting Siana, so we're really looking forward to just hanging out and getting acclamated with our newest addition. Aggie told me today that they will actually bring Siana to our hotel tomorrow at 11am. The hand-off will be done at the hotel lobby! She's supposed to call us from the lobby whenever Siana arrives. I can't imagine how nervous I'll be tomorrow morning. Tonight is our last night as a family of four. For our East coast family/friends, we are exactly 12 hrs ahead...so when you go to bed tonight, please say a prayer for our family. 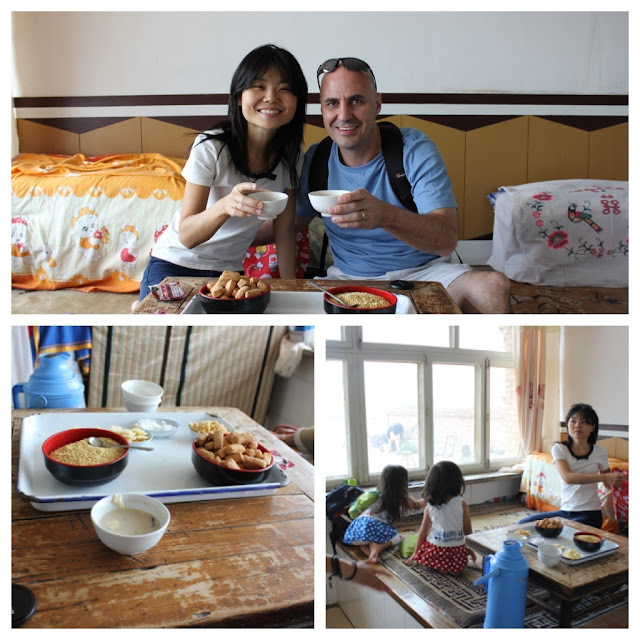 Our dear Siana Lu...the four of us have traveled all this way, and have gone through quite a journey, all because we wanted to do this as a family. We didn't want a single member to miss out on the moment we welcomed you into our family. We are so very excited to meet you...in just a little over 12 hrs. Wow, our whole world is about to change...in such a wonderful way. Everyone...I can't wait to share tomorrow's post with you. Omgoodness! I'm soooo excited for you guys!!! I LOVE all your posts Maria! Thanks so much for all the pictures and stories! I almost feel like I'm there with you! (Although, after reading the English translation of the food...I'll just live vicariously through you!...I love the cheese in pasta sauce w/ BACTERIA!! HAHAHA) I can't wait to read the greatest post of all tomorrow! Praying for all of you!